How do banana, chia, and fiber come together to make a delicious, 0 net carbohydrate smoothie that will fill you up and keep you going for hours? LC Foods Corporation has succeeded with their refreshing, thick Banana Smoothie Mix . The ingredients are fairly simple: Whey protein isolate, White milled chia seed (Salvia Hispanica L.), Inulin (chicory root) fiber, organic stevia extract, natural luo han guo monk fruit extract, natural banana flavoring, natural vegetable & tree gums, salt. 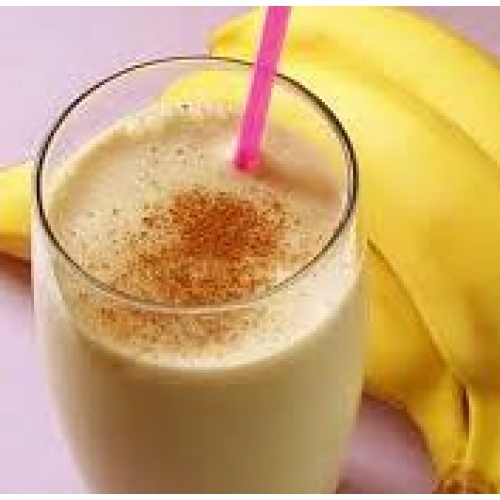 Consumers need only add 1/4 cup of the mix (roughly one-tenth of the package) with ice, water and 3 tablespoons of heavy white cream for an unbelievable banana beverage with the staying power of fiber. Based on past experiences using smoothie mixes, I was expecting a watered-down, chemical, banana-flavored chalk. What I enjoyed instead was a wonderful surprise in the form of a thick, filling, fiber-filled beverage with no carbohydrates (8 total carbohydrates, 8 grams of fiber, equaling 0 for the net carbohydrate count). You’re not going to have to fight yourself to drink these; in fact, I think it’s fair to say that the kids might even steal sips while you’re not looking. Count me as one of the many skeptics of the chemically flavored banana products on the shelves. Now consider my socks knocked off. A dollar per serving is totally reasonable given the cost of smoothies at any smoothie shop or some fast food joint. And it sounds yummy! This sounds delicious, but I’m always a little wary of chicory root after a, shall we say, delicate gastric experience with Fiber One bars in my pre-LC days (they have chicory as their fiber source). Maybe I’m ready to try again and give this a go (ha ha!). It’s definitely fibrous for sure! I didn’t have issues, but since you have wondered about chicory, I’d say stick to a single serving and see how you fare. For those who have gastric distress with the inulin, that’s a sign that those prebiotics are deficient in the lower intestine, so add slowly but do add for healthy intestinal responses and the prevention of disease. That is excellent information. Thank you so much! Thanks Misty, that’s very good to know!